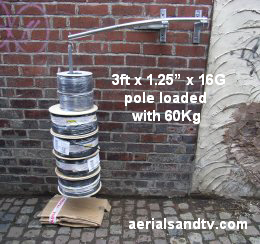 Well, back in Apr 2008 we finally got round to it, and tested most of the aerial poles on the market. As expected the 6ft x 1” x 18G (“Wickes Specials”) were the weakest, as we mention in the article on poles any installer who uses this mast must be called Bertie (as in bodger). I was surprised that the 1” the steel poles weren`t actually that much stronger than the 1” alloy abominations. The 1.25” x 18G pole is worth having over the 1”, but the 16G version is much stronger. We did expect the 1.25” steel pole to be the strongest of the 6ft poles but we didn`t think that it`s superiority over the 1.25” x 16G alloy pole would be so small. Remember that the steel pole will start to weaken as it rusts. The 10 foot x 1.5” pole lasted longer than I thought it would, but it certainly flexes a hell of a lot which is why we only recommend them for aerial up to the size of a Yagi 18. It is important to define a “FAIL” in these tests. I define failure as the point the pole would keep on bending till it was L shaped. This is generally because the tubing has kinked. It must be remembered that before (this definition of) failure is reached the pole has already passed the point where it will “return to straight” when the load is removed. Obviously as the pole gets longer it gets weaker ! 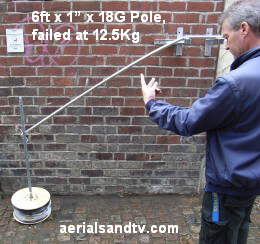 As an example the 6ft x 1.25” x 16G pole failed at 25Kg but the 3ft length needed 62.5Kg to break it. We set up a test rig on our back wall and just added weights on the end of the poles till they failed. It was very interesting testing them all to destruction, in fact it was probably the most fun you can have with your clothes on ! A 6ft x 1.25” x 16G pole tested to failure, great fun..... 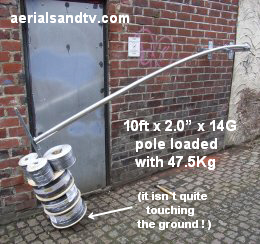 It eventually collapsed at 25Kg loading, that`s 55lbs, on the end of a 6ft pole. And that`s strong ! 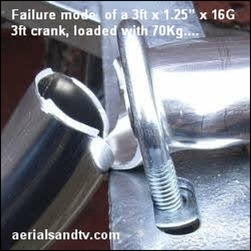 I must confess to some surprise that the cranked alloy poles weren`t actually any weaker than the straight versions, in fact the 3ft cranks were actually stronger than the three foot straights ! However it should be borne in mind that we could only test the cranked poles in one direction. Testing them with a sideways "twisting" force would just have rotated the pole in its clamps. That said, I suppose one also has to bear in mind a bit of geometry, the distance from the support, to the point at which the force is being exerted, is shorter on a cranked pole. The 3ft x 1.25” x 16G cranked pole was the strongest of all those under test. We were actually about to give up because it was getting dangerous trying to lift that much weight onto the test hook, particularly if it failed and fell on your foot ! Unlike the other poles, which kinked at the top bracket, this pole actually pulled the alloy apart, as in the picture (below right). Note how the 10ft steel 1.5in poles are stronger than the shorter 9ft alloy 1.5in poles (which we used to stock), cutting a foot of the former poles would obviously make them stronger still. Bear in mind that the 10ft steel cranks are actually about the same strength as a “heavy duty” 6ft x 1.25in x 16G crank. 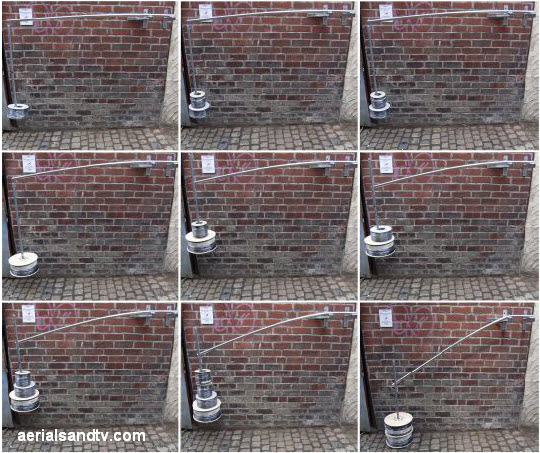 We also tested an ungalvanised 10ft crank against a hot dip galvanised one. As expected there was no difference in strength. This is because the temperature of the molten Zinc (into which the items being galvenised are submerged) is too low to have any annealing effect on the steel. There are 20 by the way, and this was just the first lot of tests….. We tested some poles twice if the results seemed abnormal. 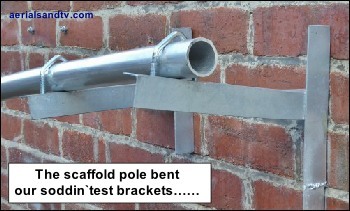 How strong are scaffold poles ? 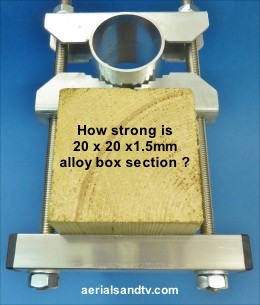 How strong is 20mm x 20mm x 2.0mm box section alloy ? 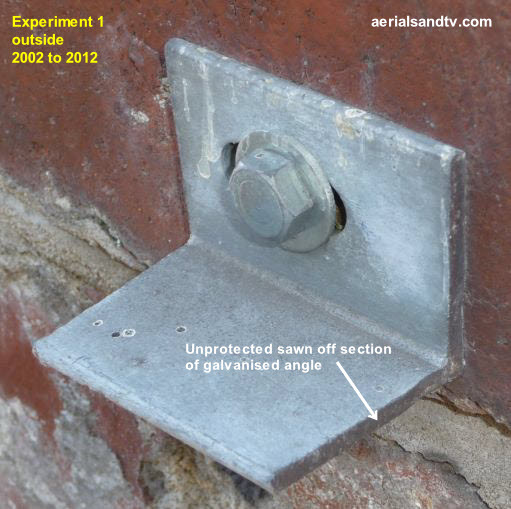 The oldest sample wasn`t actually set up as an experiment, we just needed a lip to which we could attach an inspection light and, since we didn`t want it to rust we cut off a section from a galvanised "T" bracket and screwed that to the wall. We didn`t date it but it must have been done pre 2002, so, since the picture above was taken in March 2012 it`s been out there for 10 years. As you can plainly see, although there is a small amount of rust on the cut surface, it hasn`t spread at all, which is the main thing. 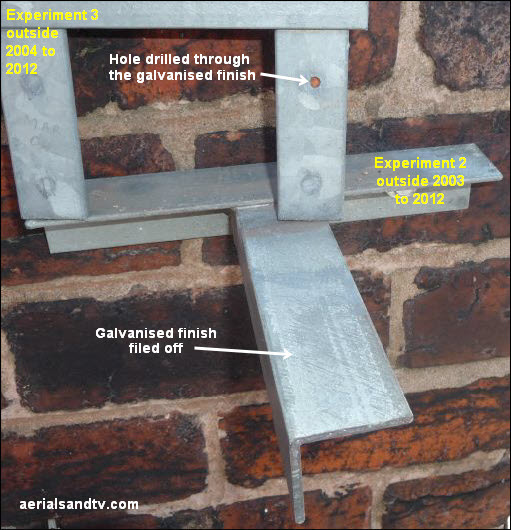 In experiment 3 (back in March 2004) we drilled a hole into a 6x6 galvanised wall bracket and placed it outside on its side so that water would collect in the aforementioned hole. As can be seen from the top picture the hole has rusted, but in 8 years outside it hasn`t spread at all. Next, in experiment 2 (Feb 2003), we tried to file off the galvanised surface on a section of galvanised "T". This has been bolted to the outside of our shop since 2003. The picture was taken in March 2012 so its had 9 years to go rusty, and it still hasn`t. Careful inspection of the close up will reveal some slight rust staining near the top edge, but that was caused by a parallel experiment in which we left a painted bracket outside for a few years. Unfortunately we left the latter on top of the galvanised one and that staining actually came off the painted bracket ! As stated on our Poles & Brackets page I really cannot understand any installer using painted brackets when galvanised are available, it really, really, really is a bodge. Well actually I can understand it. What it means is that the installer is so tight he probably needs a torque wrench to get in his wallet. He saves a quid or two, and the customer, within a year or three, gets a rusty bracket. And if the bracket`s on a light painted wall he has to repaint it every few years ! This has occurred with the install pictured on the right, coffee and cream springs to mind, which is somewhat ironic because the picture was taken at Woolley Edge motorway services (northbound), since removed ! Basically a galvanised coating can "self heal" or “bleed over” (technical name sacrificial protection) and provide a certain amount of protection even where there isn`t much galvanising left. With painted or powder coated finishes once the corrosion gets under the paint it just spreads and brings off all the protective coating. Incidentally, do not confuse zinc passivation or plating with hot dip galvanising (link). The former may be a far more durable finish than painting but is not really in the same league as hot dip galvanising. 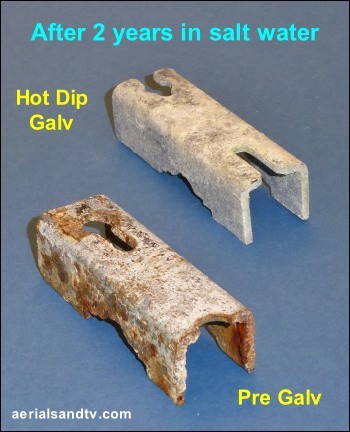 Pre Galv (where metal sheet is Pre Galvanised before being formed into the component) is superior to Zinc plated (and far superior to painted), but again Pre Galv is significantly inferior to hot dip galvanising. This is particularly the case on the edges of any pre galv component where it has been stamped out, rust can start here relatively quickly because the galvanising layer is too thin to provide adequate sacrificial “bleed over” protection to the unprotected surface. It is fair to say that plating and Pre Galv usually give a smoother and more consistent finish than hot dip galvanising, this is partly because the protection layer is quite a bit thinner and this may be significant to some people (don`t really know why.....). The other reason that pre galv usually has a smoother finish to hot dip is because the process is automated and consistent, basically a long roll of metal sheeting is unrolled, a thin layer of galvanising is applied, then it is rolled up again ! Basically, as far as we`re concerned, when it comes to galvanising, corrosion protection is the name of the game and appearance comes a long way down the list of priorities. It isn`t just about pole diameter, the gauge / thickness of the metal is just as important. As an example a 6 foot x 1.25” x 18G pole failed at only 17.5Kg, but the thicker 16G version didn`t collapse until 25Kg, and that`s a big difference. What counts is the free / unsupported length of the pole, i.e. deducting the length covered by the bracket. This can be significant. For the tests of the 3ft and 6ft poles the T & Ks were 11” apart, but when we put the 10ft poles on we widened them to 20” (to outsides). This is necessary to prevent putting too much strain on the brackets, or the brickwork.... Thus the unsupported length on the 3ft poles was actually only 2ft 1”, on the 6fts it was 5ft 1” and on the 10fts it was 8ft 4in. 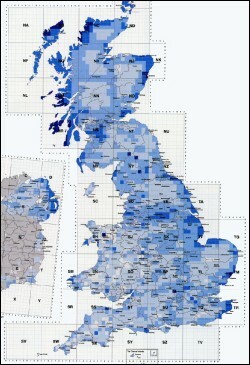 In the year 2000 the Galvanisers Association created the Zinc Millennium Map which shows graphically the average annual corrosion rate of zinc [1998 to 2000] around the UK. 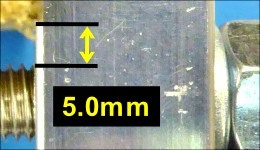 A thumbnail is shown alongside and the original is available on their website. The Galvanisers Association also give an estimate of zinc corrosion (down to 10 square Kms) on the same page. The aluminium alloy poles are seam welded (5251 grade or similar), the steel poles are mild steel. Of particular interest here is the fact that at 6ft the steel poles seem relatively stronger whereas at 10ft the alloy poles seem relatively stronger, how does that work ? (I don`t know, I`m asking you ! ) 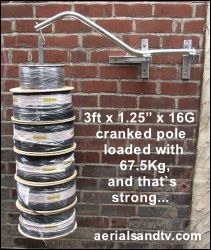 Incidentally I`d have expected the 6ft x 2in x 14G alloy poles to take more weight than they did (we tested three of them ! ), maybe the specification of the alloy was different or the gauge on the sample was slightly down, but it was still the strongest 6ft pole, which is what one would expect. To be frank wholesalers rarely quote the specifications of the alloy poles one buys from them, and, in fact, if you ask what the spec is they often don`t even know themselves, and even if they could find out some of them give the distinct impression they think you`re just being awkward asking the question ! 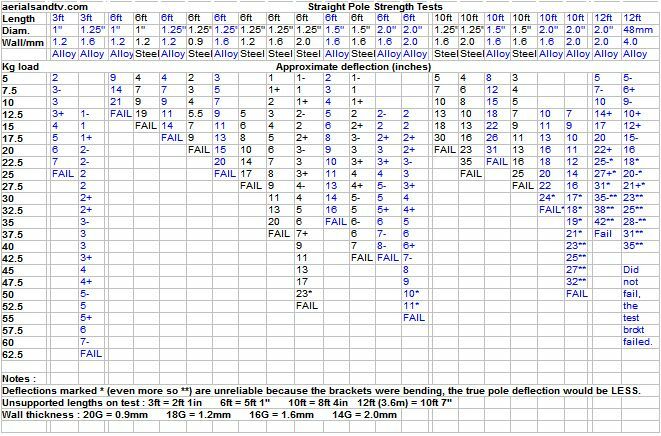 Having said all of this, there are a number of inconsistent results which cannot be down to differing wall thickness or grade of metal because the same pole was used for the 10ft and the 6ft test. The poles were were tested at 10ft then the straight bits cut off and then tested at 6ft ! These were the 1.25in x 16G steel, 1.25in x 14G steel and 1.5in x 16G alloy, and were some of the most unfathomable results ! There was an interesting addition to the results in 2015, the 6ft x 1.25in x 20G/0.9mm steel pole. I saw a 6ft pole on E Bay and couldn`t understand how it could be sold for such a low price, even allowing for the fact it was a cheaper pre galv steel job. I ordered one expecting a 1.25in x 16G/1.2mm pole to turn up because the seller didn`t state the wall thickness (a bit naughty of him really) and 16G was the thinnest pole I thought existed at that time. Oh no, it was even thinner, I reckon it was 20 gauge (0.9mm) ! So that`s how they sell stuff so cheap….. The fact it was so thin means that, in addition to its relative weakness, any rust will have an effect on the pole`s strength * rather sooner than with a thicker gauge mast. 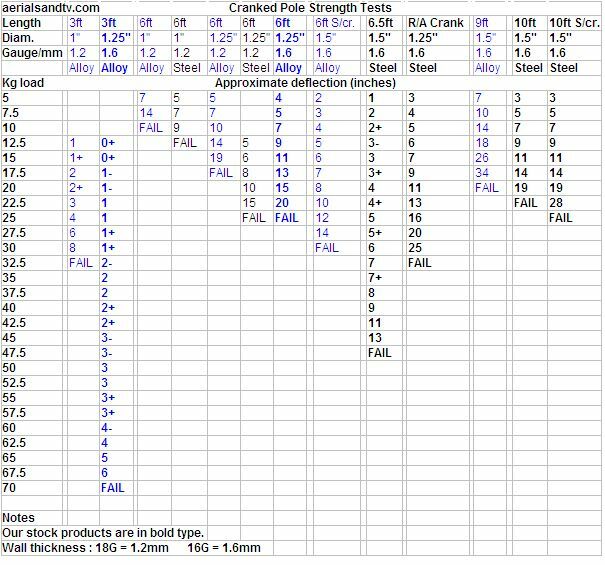 Well look on the bright side, at least we`ve now got the full set of results for 1.25in steel poles, 0.9mm, 1.2mm, 1.6mm and 2.0mm, the failure loads being 20, 27.5, 37.5 & 52.5Kg respectively. On the subject of pole strengths v gauge v wind loading see these articles. The tests were primarily to establish pole strength, but we realised that they were also testing the 12” T & K brackets we sell, and the “Rawlplug type” wall anchors. Both were very impressive. The T & Ks obviously flexed a bit under the type of the loadings we were putting on them, but they didn`t bend that far (excluding the scaffold pole test…. ), and never looked anywhere near failing. As for the wall anchors, I`ve got to say that unless your brick is soft or your hole is too big (so you can`t get decent tightening torque on the screws) one has to wonder whether using “Rawlbolt” type fixings is worthwhile, particularly if one remembers the hole drilled in the wall needs to be bigger. You only have to look at the pictures below to see we were putting on so much load that even the strongest poles were failing, yet the (10mm x 50mm) “Rawlplug” type wall anchors [and the brackets come to that] never showed up any deficiency whatsoever. That said it must be admitted that sleeve anchors are significantly stronger than screw + plug fixings, plus the fact that the excellent performance of the screw/plug anchors was with holes only used once. When we tried reusing the same holes with new plugs (for tests at a later date) their performance wasn`t quite so impressive (we assume because the hole had been made slightly bigger ? ). Not that most people would be reusing anchor holes ! Now, it has been pointed out to me (more than once….) that these ‘tests’ of the wall anchors are only partly relevant “because they`re only being tested in shear”, not in tension, i.e. being pulled straight out of the wall as they would if the wind was blowing directly onto or off wall. However, as load is put on the pole the test K bracket will attempt to pull itself off the wall pivoting around the bottom (the T will do the opposite and pivot around the top), thus some of the anchor(s) are in tension in these tests. 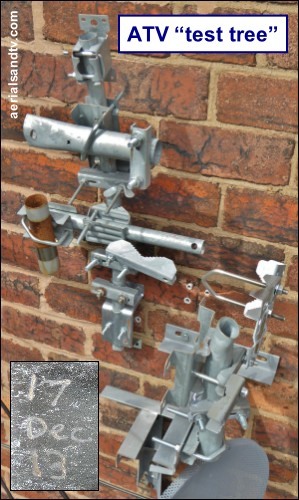 Always remember that the wind can act to pull wall anchors straight out so (particularly on a install with a long pole or large aerial) that should remind us that it`s important to have plenty of them in : more wall anchors = a stronger install. NOTE : the SWL in wood (just the screws*, obviously….) is significantly greater than for the screw/plug combination in masonry. In fact in some tests I was informed about the SWL in pine (a softwood ! ) was up to four times higher than for the screw/plug combination in masonry. I expected it to be as strong, or even slightly stronger, but not that much higher, and in softwood ! It is obviously important that the screw is installed correctly (i.e. the pilot hole isn`t too big) and it`s tight, but not so tight the head of the bolt is sheared off, I wouldn`t go higher than the 15 to 20lb/ft quoted below. * This would be for the plated wall screws, the stainless ones have a shallower thread more suitable for use with plugs in masonry. The thread is just to draw the screw into the plug to force it open and give a wedging effect, it takes no significant part in the pull out strength of the anchor. This can be proved by fact that when any screw/plug anchor fails it`s the plug which pulls out of the masonry, it`s almost never the screw pulling out of the plug. Before we go any further, I`d better touch on stainless steel grades. Most stainless steel nuts bolts and washers sold in this country are either A2 / 304 grade or A4 / 316 grade. In terms of corrosion resistance the former is out performed by the latter, in fact A4 grade is often referred to as “marine grade”. The down side is that it`s more expensive. It`s something I didn`t actually know but stainless does actually corrode, just very slowly ! I can remember being sat at this outside cafe and looking at the legs of the table, they had a very small amount of rust pitting on them and I was intrigued as to what they were made of to rust but so minimally ! It must be said that for the vast majority of uses A2 stainless is fine, it`s certainly leagues ahead of the next best alternative (for most nuts and bolts) Zinc plating. In fact on a decent quality install the Zinc plated V bolts will always be the first things to rust. 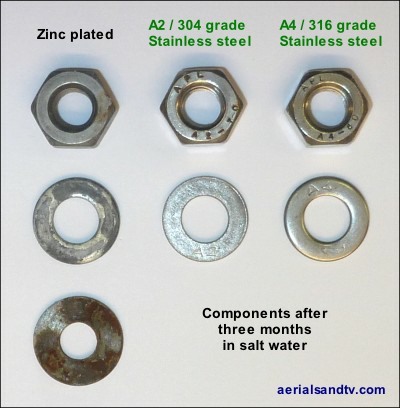 I`d often wondered just how much better stainless steel is than zinc plating in terms of corrosion resistance terms. So, in late July 2014, I set up two tanks, one with water in it and one with salt water. Into them I placed various nuts and washers in stainless steel (A2 and A4) and with a zinc plated finish. 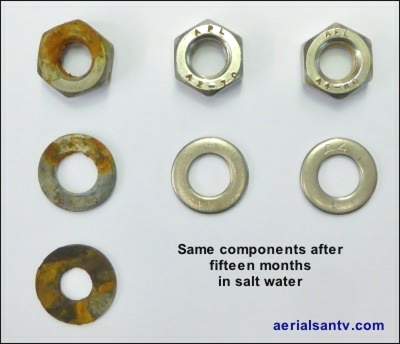 Below is a picture of the components (out of the salt water tank) after three months, though it must be said one of the plated washers started showing signs of rust within 6 weeks. By way of comparison, in previous experiments I`ve put in unplated screws and they started rusting within 24 hours. Rather surprisingly the plated components in the (non salt) water tank were nearly as corroded as in the brine. As and when I`ve got time (and there`s anything to report ! ), we`ll revisit these tests periodically in the future ! The picture is fairly self explanatory. There looks to be a small amount of discolouration on the A2 nut but you`ll have to take my word for it that that is just the lighting ! The plated nut is rusting, you just have to look closely. All the plated components looked a lot worse before I cleaned off the rusty water on them for the photograph. In these kind of tests it always surprises me how much difference there is in the corrosion of supposedly identical Zinc plated components, as in this test for instance. But the fact is I don`t think it`ll be long before the middle plated washer is rusty as opposed to greatly discoloured…..
Just out of interest we put a hot dipped galvanised bracket in the salt water bath and after the same 3 month period there was no rust on it. Discolouration yes, but no rust. After 15 months there was rust on the (deliberately) cut off end of the bracket, but it hadn`t spread. Further interesting point, oh yes, there`s more. In the past the amount of localised pollution was the most significant factor affecting the life of galvanising protection but the clean air act has diminished its significance (relative to seaside locations) in this regard ! In fact there is a direct relationship between the corrosion rate of zinc (the protective component in galvanising) and atmospheric levels of sulphur dioxide and levels of the latter have dropped considerably since the 1970s*, thus galvanised products last longer now than they did at one time. * I`m not an expert in this field but I would think one of the main reasons for this would be the fact coal and oil power stations must now have to be fitted (at great expense I may add) with Flue Gas Desulphurisation equipment to remove said sulphur dioxide from the power stations` combustion gasses. The same, but more so….. Absolutely no corrosion on the stainless components. Interestingly (possibly unsurprisingly ?) the plated washers weren`t as corroded on the undersides, where they`d been resting on the bottom of the tank. Possibly due the movement of the salt water being restricted under them ? How strong are plate mounts ? Well the title just about covers it all I`d have thought ? When we started stocking plate mounts (sometimes called satellite mounts or patio mounts) in December 2015 we were interested to know just how strong they are. We sell them in 1.25 inch and 2.0 inch pole diameters and I knew it`d be pointless trying to fail the 2” models. What we can be certain is they`d be significantly stronger than the 1.25in mount. Anyway, as you can see, the “standard duty” 1.25in x 16 gauge (1.6mm) plate mount still hasn`t failed with 65Kg on it, though to be honest I`m unconvinced it`d have taken much more ! 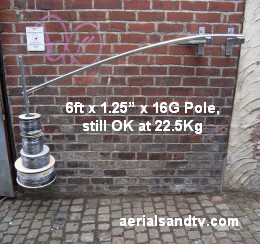 To put that into context a 6ft x 1.25in x 16 gauge alloy pole, which is definitely a “heavy duty” aerial pole, fails at about 25Kg…..
QED the 1.25” plate mount would take any aerial or a zone 2 (approx 60cm) satellite dish with no problem at all. I`d be very surprised if the 2” model wouldn`t comfortably take a 1m dish. Note : we only used three M8 sleeve anchors to bolt the mount to the wall because we couldn`t be arsed to fit four, but they still took the weight with nonchalant ease. As well they might with a SWL of 300Kg each ! There is a bit more to this picture than first meets the eye. We cut off the end of each of the saddles so as to ensure there was no galvanised coating on it, though that was somewhat unnecessary for the Pre Galv item as those aren`t galvanised where they`re stamped out (of the sheet) anyway. As you can see there is no rust on the hot dip galv component, even on the exposed edge, where bleed over protection has occurred. Obviously most components are not subject to salt water immersion (note the white salt deposits on the samples) but it just accelerates the result. At present we have a “test tree” of various hot dip and pre galvanised components outside (see below), but it will take a few years yet before the results are as clear cut as these ! Here it is, the ATV test tree, and very interesting it is, as I`m sure you`ll all agree. Back in 2013 we decided to started testing examples of the clamps (and saddles etc) that we sell. Generally we file off some of the coating and/or saw off a section of the sample, although doing the latter, as stated before, is somewhat unnecessary in the case of Pre Galv products because they`re stamped out of the sheet anyway. Those exposed edges of pre galv products start rusting within a few weeks or so, as do any areas where the pre-galv has been filed off. On the undamaged items some has started to get corrosion spread (from the stamped out edge) after 3 or 4 years, in the worst cases that corrosion has spread 3 or 4mm, so far…. A few of the zinc plated bolts started to corrode after only a few years…. Basically the test tree has just confirmed what we `ve always said, hot dipped galvanised is far better than Pre Galv, though stainless is obviously the best. Anyway, we fabricated the test rig shown in the picture and checked how much torque we could put on the nuts before the box section bent and/or crushed. As an aside, to do this I had to bring my old torque wrench from home, but was it accurate ? It read 20% high by the way ! The 0.8mm box section crushed at less than the minimum 12lb/ft setting on the torque wrench, so we tried 1.5mm wall thickness next. That wouldn`t crush or bend (though the gap was only 5mm) even at 30lb/ft torque, by which time it was not only getting hard to hold the rig, but the wood post section was getting crushed and, most significantly, the pole was being crushed as well ! And the pole was 2 inch diameter by 2.0 mm wall thickness ! Why, we asked ourselves, would anyone need to go any higher torque than this ? So we stopped at that, but, just to be sure, we decided to stock 2.0mm wall thickness anyway ! And that`s a two inch pole of 2.0mm wall thickness ! OK this was a light hearted test, but one of us put all their weight on the middle of a length of our 2.0mm wall thickness box section which straddled two tables 1.0m apart. It bent, but then more or less returned to straight ! We were impressed. Note that the weight was spread over about 1ft in the middle of the test piece, I accept a slightly more stringent test would be the weight concentrated right in the middle, but we`d already proved our point so couldn`t be arsed to go to those lengths…….. I suspected the test brackets might take a bit of a hammering so I`d placed a support pole (removed in the pic) under the K [the K is effectively pushed down and the T pulled up] and used a sleeve anchor on the bottom of the “extended T” (see bottom of the latter in the picture). With the benefit of hindsight I should have installed a wall anchor a few feet above the T and wedged a pole between that and the end of the T to stop it moving upwards…. 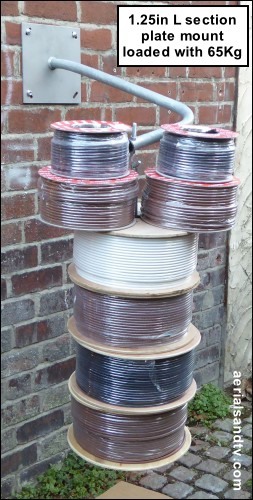 Spun galvanised. These are hot dipped products which are then spun to remove excess galvanising which may fill smaller holes or required detailing, e.g. our saddles are spun galvanised. Although the coating is thinner than simple hot dipped it`s over twice as thick as pre galv plus the products do not have the “stamped out” (ungalvanised) edge.